For a special occasion your vichyssoise will look fantastic served in chilled glass dishes or large goblets. 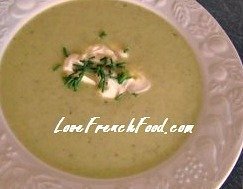 Vichyssoise is a very simple and creamy soup from France which is served cold with a little soured cream or creme fraiche and just a sprinkling of fresh herbs such as chopped chives. It is a wonderfully creamy summer soup and especially good for entertaining as it can be prepared well in advance and you have no work to do but to serve it! With very few ingredients this has to be one of the easiest soups to make and we have an excuse to spoil our family and friends with so little cost and yet give them something extra special. There is some controversy as to whether it actually originated in France or whether it was an American recipe. Julia Childs, in her book 'Mastering The Art of French Cooking' page 39, calls it an American invention. Others say that it was a French Chef, Louis Diat, working at the Ritz-Carlton in New York city who invented the recipe and named it after the town where he came from - near Vichy, in France. Who knows the real origin, but I think the French Chef working in America means perhaps both are right. · 2½ pints(1.5litres) chicken stock - or you can use vegetable stock if you prefer. · Put the chicken or vegetable stock into a large heavy bottomed pan and bring to the boil. · Peel and cut the potatoes into small pieces. · Add to the pan of chicken stock. · Lower the heat and cook until just tender. · In the meantime, clean and cut the leeks into small pieces. · Add the leeks to the pan of potatoes. · Cook for about 20 minutes on a low heat until the vegetables are soft. · Puree the soup in a blender or food processor or if you prefer it can be pressed through a sieve. · At this stage, if you are using cream or crème fraiche, stir this in and cool. · To serve, pour into chilled bowls and garnish with a swirl of cream and chopped herbs.